* Clan Lasombra profile with rules for their Discipline. Playable for the first time in the V5 line! * Loresheets to help players incorporate Vampire’s deep metaplot into character backgrounds. * Dedicated chapter to help Storytellers build their own city with characters, coteries, story hooks, and more. * Updated and new metaplot explaining the hierarchy of Kindred in Chicago and ways to incorporate characters. 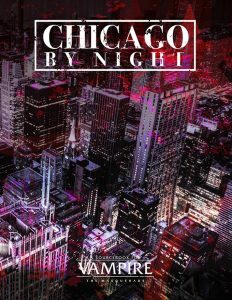 Chicago By Night will employ the new Vampire: The Masquerade 5th Edition rules, and the manuscript is in its final stages. The newly launched Chicago By Night Kickstarter, which funded within hours of launch, is for a hardcover edition of this supplement and includes a special retailer-facing tier. Standard digital and print editions will be released following fulfillment of the Kickstarter.